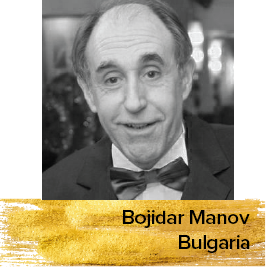 Prof. Dr. Bojidar Manov is a Bulgarian film critic and journalist who served as the Vice-President of FIPRESCI from 2001 to 2005. Dr. Bojidar also served as the Dean of Cinema Faculty in Sofia. Currently, he is a Member of Bulgarian National Film Board and European Film Academy. He also occupied the position of president and a jury member of different international film festivals in Berlin, Cannes, Venice, Karlovy Vary, San Sebastian etc. As an author, he has eight books under his belt.